Do you recognize this item of a concentration camp prisoner? A gold-plated wrist watch with a red band, an engraved pocket watch, numerous jewelry items and wedding rings, and of course photos. Those are all items taken from prisoners in German concentration camps, which now can be viewed online, as part of the new archive of the International Tracing Service (ITS). 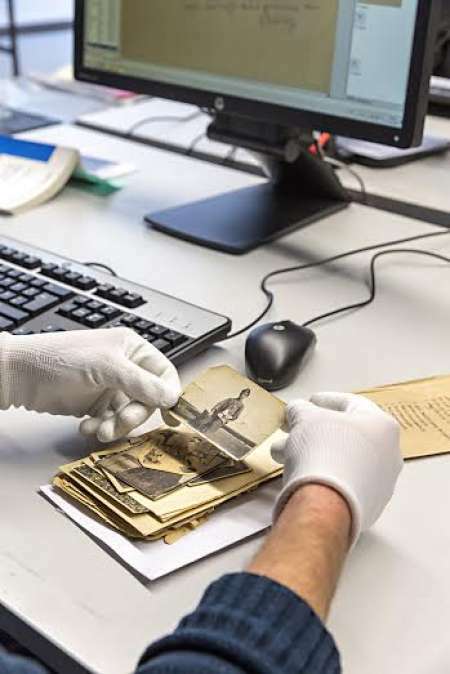 50,000 documents have been uploaded last week to the center's website, among them are photos of 3,300 personal items which lay in ITS's archive in Bad Arolsen, Germany, just waiting for someone to recognize them. ITS"Dr. Christian Groh, Head of Archives at International Tracing Service (ITS)"
The personal effects belong to prisoners of Dachau and Neuengamme concentration camps, as well as items collected by the Gestapo in Hamburg. Some of them reached the ITS in 1963, after the Bavarian Compensation Office located in its archive 339 envelopes that contained the personal papers and pictures of former inmates. Additionally, the same year the ITS received approximately 4,300 similar envelopes from the office in charge of restitution in Stadthagen. Not only valuables could be found there: Objects like an empty wallet, a coin and a random key, were also part of the inventory. The names of most owners were known to the ITS, but only a few of the heirs contacted the service to claim back the belongings. Also put online as part of the new archive, were documents concerning the routes of Death Marches and locations of burial sites, and files of the Child Search Branch founded by the UN after the war. Under each item, visitors to the site can leave a comment, and as researchers hope, reveal previously unknown information. The ITS was established by Western Allies in the final days of World War II and was initially run by the Red Cross to help uncover the fates of Holocaust victims and others. By the mid-1980s, the ITS returned some 900 of the personal effects it received to national Red Cross societies or to similar institutions in other countries, or passed them on to the former inmates or their family members. “Nowadays we still receive almost a thousand requests a day, from researchers or relatives - often second, third and even fourth generation – hoping to find some information on their predecessors,” said Groh. ITS"An ITS archivist sorts through Holocaust era photographs for the online archives." Success stories also occur. Last May The ITS reunited two German brothers who survived the war as children and lost touch in an orphanage in Augsburg in 1950. In August of this year, a 91-year-old Italian woman met the daughter, now 70, she had with a German soldier during the war and whom she hasen't seen since birth. Some of the personal effects have too found their rightful owners,three items last year, and another earlier this year. Over the next two years, the archive director plans to expand the online archive and add up to 200,000 documents, including passenger lists of people allowed to immigrate, mainly to the US and Canada, and scanned original files from concentration camps, like Dachau and Buchenwald.